‘Your Majesty,’ said Sir Kale, kneeling before the large wooden throne in the castle’s great hall. All the other knights and important people of the castle were watching with great expectation. 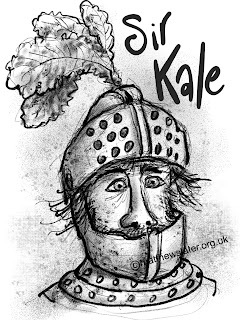 ‘I… I would like to go travelling.’ Sir Kale offered hesitantly. ‘I would like… a big ball of string.’ Sir Kale wasn’t sure how the King would respond. ‘Long enough to reach the edge of your kingdom. So that I might leave a trail and be able to find my way back to the castle again.’ said Sir Kale. The King thought for a moment, looking around him as if trying to get inspiration from the people gathered before him. ‘I shall give you the largest ball of string this kingdom has ever produced to enable you to journey out and find you way back here again. In return, I will expect…’ the King hesitated. ‘Yes… Your Majesty?’ Sir Kale was wondering what this was all leading up to. ‘I want you, Sir Kale, to keep my kingdom supplied, all year round, with…’ he paused as if waiting for dramatic effect, ‘cabbages.’ The King smiled and leant back in his throne. ‘In that case, you may leave and I wish you well.’ The King waved Sir Kale to go, seemingly satisfied with the deal. So Sir Kale, with his trusty horse laden with a saddle pack full of supplies and his suit of armour lying across its back, set out one morning from the castle gate to cheers and applause from well-wishers. The ball of string he could just hold in his strong arms. It weighed nearly as much as his suit of armour and he hoped it would be long enough. For six months the trail of string led out from the castle gates across the hay meadows and into the wild forest. Here it followed cart tracks, woodman's paths and deeper into places that few people ever went, always leading away from the castle. By now the string was showing signs of weathering and those who looked out each day for the return of Sir Kale began to grow anxious for him. Eventually, the King ordered a search party to be sent out comprising six of his best knights on horseback. For five days the knights followed the string deeper into the forest. Every so often they found makeshift campsites where Sir Kale had stopped with his horse for a rest. Then, on the sixth day, in torrential rain, they emerged out of the trees to find themselves looking at nothing but a stretch of grass and a thick bank of low cloud obscuring any view ahead they might have had. Here the string ended with no sign of Sir Kale or his horse. On the ground, tied to the end of the string was a small tin that had once held biscuits. One of the knights picked it up, opened it and found inside a small handwritten note on a piece of parchment. He read it and then looked thoughtfully into the heavy mist.